The NovAliX Conference will now take place at HILTON STRASBOURG - More info here. Read the Testimonials of the 2015 Conference attendees now! 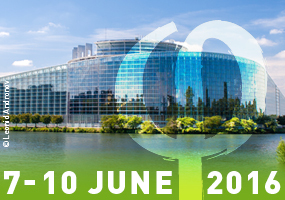 During the same week of June a session of the European Parliament will take place in Strasbourg, we therefore recommend you to book your accommodation well in advance! For the third time, NovAliX is organising its Biophysics in Drug Discovery Conference. This new edition will cover current hot topics including cryo-EM and introduce new features. Because of the ever growing success of the two first editions, we will change the venue and relocate the event to the newly renovated Strasbourg Convention Centre. The use of biophysical methods in drug discovery is rapidly increasing and the field is in constant evolution. Many pharmaceutical companies have set up in-house biophysical platforms to speed up the target-to-candidate process and improve the quality of small-molecule therapeutics through a better understanding of their interactions with their targets. Academic labs involved in early-stage drug discovery also heavily rely on biophysical techniques. The third edition of the conference intends again to bring together biophysicists and medicinal chemists, the synergy between their disciplines being key to deliver better drugs on a shorter timeline. and we are pleased to announce that Sandra Cowan-Jacob (Novartis Institutes for Biomedical Research, Basel, CH) and Gérard Bricogne (Global Phasing Ltd., Cambridge, UK) will deliver the Keynote Lectures. The Scientific Programme will be completed by Exhibitor short presentations, a Poster Session and a Commercial Exhibition.